LONDON, UK (ANS – May 20, 2017) — On his first pastoral visit to the UK, His Holiness Pope Tawadros II, 118th Pope of Alexandria and Patriarch of the See of Saint Mark, has been visiting Coptic Orthodox parishes and meeting with communities across the United Kingdom, as well as receiving a royal welcome. According to the Media and Communications Office of the Coptic Orthodox Church UK, Pope Tawadros has consecrated churches, presided over Liturgies and Vespers services, and addressed hundreds of young people at a Coptic youth gathering. During his visit, Pope Tawadros II was received by Her Majesty the Queen at Windsor Castle on May 9, 2017. This historic audience with Her Majesty was also attended by His Grace Bishop Angaelos, General Bishop of the Coptic Orthodox Church in the United Kingdom, and the Rt. Rev David Conner, Dean of Windsor. During the meeting HH Pope Tawadros II presented Her Majesty with a Coptic icon depicting the “Flight to Egypt” of the Holy Family. Shortly after meeting with Her Majesty the Queen, Pope Tawadros was received by His Excellency Mr. Nasser Kamel, Ambassador of the Arab Republic of Egypt to the United Kingdom, at a dinner and reception at the Egyptian Embassy in London. The reception was attended by Coptic clergy and laity, as well as the wider British Egyptian community. The lunch was attended by members of the House of Lords, guests from other Christian faiths, and members of the Coptic Orthodox clergy and community in the United Kingdom. Following the lunch, Pope Tawadros laid a wreath at the Recording Angel memorial in Westminster Hall, in honor of PC Keith Palmer, who lost his life in the Westminster attack on March 22, 2017. During his stay, Pope Tawadros received individuals and groups at The Coptic Orthodox Church Centre in Hertfordshire, including the Coptic Medical Board and the Coptic Partnership for Relief and Development, both established by Bishop Angaelos with members of the Coptic community to ensure the highest level of collaboration for those most in need in Egypt. Among his meetings, His Holiness also received His Royal Highness Prince El Hassan bin Talal of Jordan. The media release went on to say that on Friday, May 12, 2017, His Holiness Pope Tawadros II was received by The Most Revd. Justin Welby, Archbishop of Canterbury, at a historic meeting in Lambeth Palace. During the visit, Pope Tawadros met privately with the Archbishop, later joining the rest of the Coptic delegation and ecumenical guests, when addresses were delivered. His Holiness signed the official guestbook with the words “Love Never Ends”, and presented a Coptic icon of the “Flight to Egypt” of the Holy Family to Archbishop Justin Welby. Following the meeting at Lambeth Palace, the two Church leaders and their delegations, attended Evensong at Westminster Abbey at the invitation of the Dean of Westminster, the Rev. Dr. John Hall, walking side by side during the procession, and praying together at the shrine of St Edward the Confessor. Evensong was followed by a general meeting led by His Holiness the Pope, with members of the Coptic community, in St Margaret’s Church, Westminster Abbey. The Pope gave a sermon and presented gifts to members of the community. On May 17, 2017, His Holiness the Pope, accompanied by Bishop Angaelos, was received by His Royal Highness the Prince of Wales at Clarence House in London. In December 2013, His Royal Highness the Prince of Wales was received by Bishop Angaelos at The Coptic Centre in Stevenage for the first time, as part of a series of visits in which he sought to highlight the plight of Christians in the Middle East. His Royal Highness continues to be supportive in response to the suffering of Christian and minority groups in the region. At the commencement of the visit, an official vespers service was held in his honor at the Coptic Cathedral of Saint George in Hertfordshire. The event was held on May 6, 2017, and was attended by members of the House of Lords, the Diplomatic Corps, the Foreign Commonwealth Office, the Home Office, humanitarian and advocacy organizations, and various ecumenical and inter-religious guests. Commenting on the visit as a whole, His Grace Bishop Angaelos said: “It has been a blessing for the Coptic community here in the United Kingdom to engage with their shepherd. It was also an opportunity for His Holiness to meet his flock and to encounter some of the work being done under the various ministries within the Coptic Orthodox Church in the United Kingdom. For more information, please contact: Angela Mikhail, Director of Communications at The Coptic Orthodox Church UK — Tel: +44 (0)20 71937076, or by e-mail at: Media@copticcentre.com. 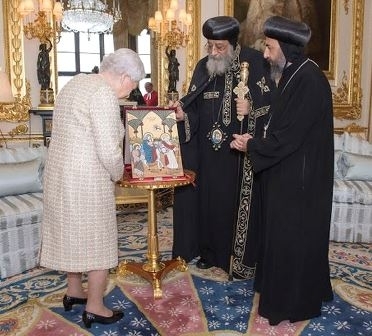 Photo captions: 1) Her Majesty the Queen looking at the Coptic icon depicting the “Flight to Egypt” of the Holy Family, as His Holiness Pope Tawadros II and His Grace Bishop Angaelos look on. (Photo: Press Association). 2) Official Vespers Service and Youth Day in honor, and in the presence, of HH Pope Tawadros II (pictured) at The Coptic Cathedral of Saint George (Photo: Marcin Mazur). 3) The Archbishop of Canterbury greets His Holiness Pope Tawadros II. (Lambeth Palace). 4) Prince Charles looking at the Coptic icon depicting the “Flight to Egypt” of the Holy Family, as His Holiness Pope Tawadros II, and His Grace Bishop Angaelos, look on (Photo: Mr Sami Gabriel). 5) Dan Wooding with some of his 45 books. (Photo: OC Register). 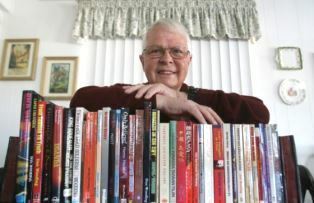 About the writer: Dan Wooding, 76, is an award-winning author, broadcaster and journalist who was born in Nigeria of British missionary parents, and is now living in Southern California with his wife Norma, to whom he has been married for 54 years. They have two sons, Andrew and Peter, and six grandchildren who all live in the UK. Besides running the ASSIST News Service, Dan has written some 45 books and hosts a weekly radio show and two TV programs in Southern California. He has reported from most of the world’s hot-spots, including Egypt, and is one of the few Christian journalists allowed into to North Korea to report from this secretive country.